These peppers are known to be the sweet variety of Capsicum Annuum, and are generally used as a vegetable rather than a spice. Can be used in a varitety of ways to add flavor to salads, sauces and more or eaten raw on its own. Some cultures also make it into a beverage. Green, bell shaped fruit of the Capsicum family. Choosing: Make sure that the peppers have no bruising, skin wrinkles, and visible holes. The peppers should feel firm. Buying: Usually, the green bell peppers found in supermarkets are unripe yellow or red bell peppers. Some green bell peppers remain green as they ripe. One can seek advice from their local grocery store about the bell peppers they sell. Procuring: Those interested in growing peppers can grow them from small plants or from seeds. If planting seeds, peppers can be planted during early spring or at winter's end. Mature the seeds indoors then transfer them to outside after two to three months. Green peppers can be enjoyed raw since they're sweet and crunchy. 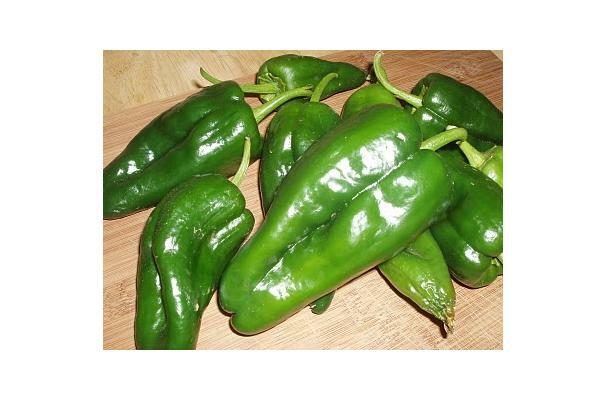 Usually, green peppers can be found in Mediterranean and South American recipes. Green bell peppers are usually prepared by slicing off the pepper's top, then hollowing out the pepper, removing the seeds. Cleaning: Wash the green bell pepper by gently scrubbing the bell pepper's skin, taking care not to bruise it. History: Peppers originally came from Mexico, Central America and northern South America. They found their way to the rest of the world through Spanish explorers, who brought back seeds to Europe in 1493.